Despite what Sean would have you think, these are not the feet of a homeless man on a park bench. 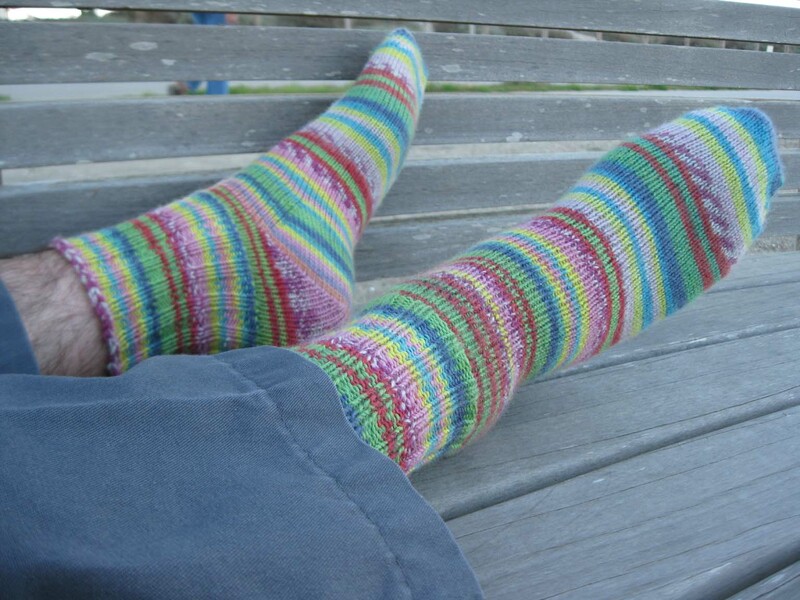 “Go sit on that bench and put your feet up, so I can take a picture of the socks,” I told Sean. We were at the end of the Embarcadero walking path near the Morro Bay Rock. “Pull your cuffs up from your ankles, so I can get a good photo,” I said, ignoring the fact that now he did look like some guy passed out on a park bench and there were people walking by and staring. He made some noises but obliged. 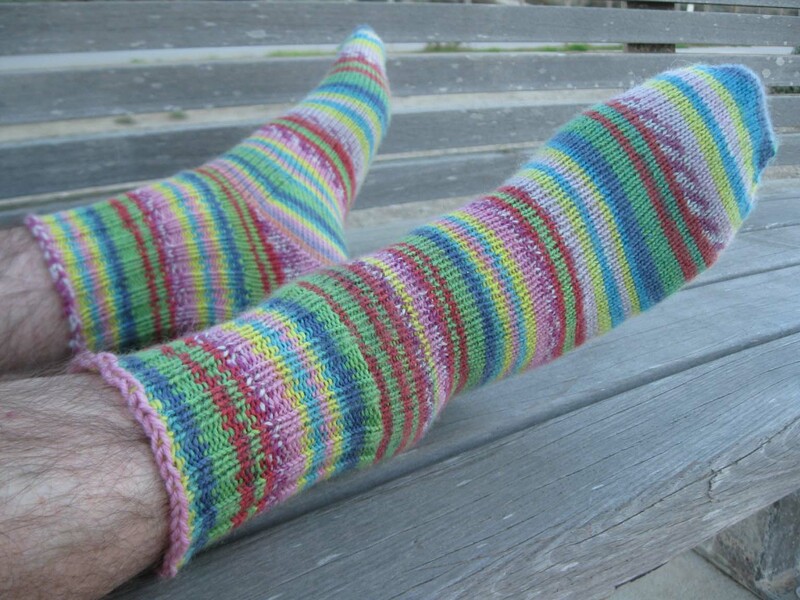 It wasn’t until after I’d snapped the photo and looked at it did I realize that now I had a picture of what looked like naked hairy legs wearing nothing but knitted handmade socks. He pulled the cuffs back down but remained in his homeless-man-passed-out-on-a-park-bench pose and I got a picture of this. Awake or passed out, who can tell? “Just– just cross one foot over the other ankle. Like, try to make your feet look perky, or something. I just need to get a good picture of the socks.” I was acutely aware that the tourists who’d been looking at the sea otters were now looking curiously at me and the camera and the homeless guy on the bench. “Thanks for being my foot model,” I said to Sean on the walk home. 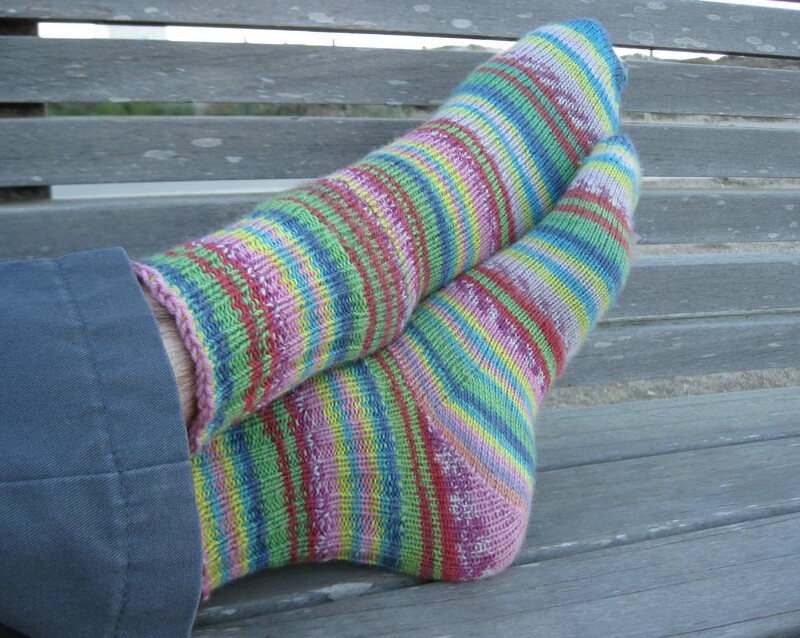 Categories: Handmade | Tags: knitting, Morro Bay, Sean, socks | Permalink.